From Saturday 4 pm till next Saturday 10am. Available only in june. Start and end dates will be specified by appointment. From Sunday 4pm till next Sunday 10am. Not available from 1.1. till 21.3. From Friday 4pm till Sunday 10am. Start and end dates will be specified by appointment. A bath barrel will guarantee your maximum relaxation at our cottage. It can be used throughout the year. 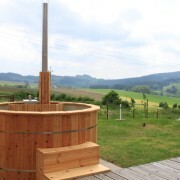 In winter, the water inside the barrel is heated by a wood burning stove which is fitted under the water surface. The bathers are protected from the stove by wooden casing. The board around the stove is an ideal place for drinks and dainties so that they will be in easy reach. 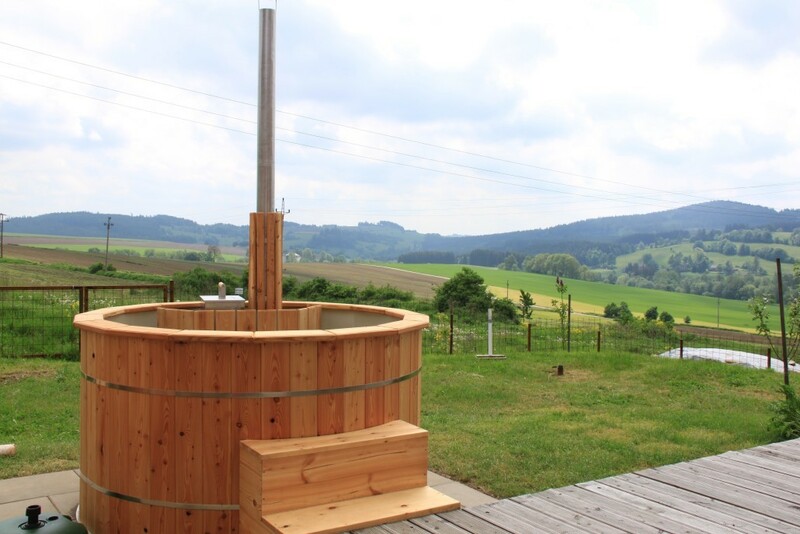 In summer, you can use the barrel to refresh yourselves on sultry days which also come to the Vysočina region. The maximum capacity of the barrel is 6 persons. The listed price is for a week. The guests pay the electricity consumption at the price charged by the supplier and water costs at the time of their departure after deducting the relevant amount. The price of the stay includes one basket of stovewood, further costs of stovewood will be charged on the basis of the wood consumption at CZK 1,500 per cubic metre. The guest pays the full price of the accommodation in advance to the account sent by the accommodation provider. In addition, the guest pays a refundable deposit of CZK 5,000 upon checking in at the cottage. The local fee (CZK 15 per person per day) is not included in the price and will be paid upon departure. The minimum stay during months july and august is 7 nights. The minimum stay during the rest months is 2 nights (the final price will be determined on a case by case basis). The cancellation fees are determined from the basic price of the accommodation for the entire booked period.